I woke up to this Google doodle greeting on my birthday. It was like having two birthdays this year. I celebrated it first in Sydney, Australia and then 14 hours later I started receiving greetings from my home in Bolivia and from friends in the USA and other parts of the world. That’s Mount Yengo in the distance which, according to Wikipedia, is a natural feature of spiritual and ceremonial importance to the Wonnarua, Awabakal, Worimi and Darkinjung Indigenous Australians. In indigenous mythology, Mount Yengo is the place from which Baiame, a creational ancestral hero, jumped back up to the spirit world after he had created all of the mountains, lakes, rivers and caves in the area. Baiame flattened the top of Mount Yengo when he jumped skyward and the flat top is still visible today. Following a narrow bush track, we came to a large dome of rock which held several Aboriginal carved figures…. Parts of the bush and surroundings were peacefully still and quiet while others were full of bird song, some of which I recorded. If you have never heard Australian bell birds before, take a listen to them on this piece of video I made. There are some raucous kookaburras and other unidentified birds joining in too. This little guy (courtesy of Wikipedia) is responsible for those pretty, tinkly wind chime sounds. I picked up a gum leaf in remembrance of the day. I think this leaf shape will have to appear in one of my woven pieces soon among colors of the Australian bush. My weaving friend Berna enjoys weaving leaf patterns too. Here is a picture she recently sent me of a couple of backstraps she has made. On one she has woven a leaf and creeper motif using supplementary weft. Between bush outings, I visited my weaving friend, Emerald, and taught her the ñawi awapa tubular band in wool. Emerald and I spent time together looking together through the beautiful book on Sazigyo, Burmese manuscript binding tapes woven with tablets, that she owns. It was lovely listening to Emerald read the words woven into the tapes in Burmese and surprising to hear her translation of some of them to English. It wasn’t what I had been expecting at all. I took a few moments here and there to try out the Peruvian headband braid that I learned in Rodrick Owen’s class at the recent Braids conference. We had worked it in wool in the workshop and I was keen to try it in cotton. I had found maintaining even tension challenging enough in wool but it was even more challenging in cotton. Practice, practice…I will come up with a way of handling the threads that will make it easier to create and maintain good tension. The cotton threads just want to slip and slide past each other whereas the hairy wool threads tended to rub together and mesh eventually creating a better hold on each other. This is precisely the width that I want for a wrist cuff and it perfectly suits the size of the findings that I bought. There are several mistakes where I was finding it hard to see twists in the black thread. I am accustomed to working with black thread and think that better lighting will put things right for the next attempt. This one will go in the ”sample” box. I am just happy that I still remember how to do it and that the notes I took during the class continue to make sense. Ply-split braiding! A little boutique called South of the Border, which claims to be ” a little bit theatre, a little bit beach and a little bit luxury”, was selling crocheted Wayuu mochilas with their gorgeous ply-split straps. This was not something I was expecting to see in Sydney! Nope, I didn’t ask the price. And, while still on the topic of Braids 2016, I received quite a few questions from various people, after my last blog post, about my friend Marilyn Romatka and the bow loom weaving that she teaches. I showed some pictures in my last post of Marilyn, my fellow instructor and roommate, at Braids 2016. It seems that many people are intrigued with these neat little looms and are scouring their yards and neighboring parks for suitable sticks that can be bent into bows. The looms themselves are interesting as are the bead-edged bands that Marilyn teaches people to make using them. 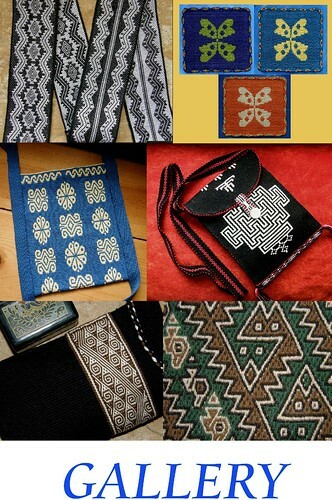 These are based on bands made by the Akha people of northern Thailand. Marilyn has been a long time supporter of passing on folk art and indigenous craft skills to the younger generation and has published a book in which she provides lesson plans on folk art and craft for home-schooling parents. Her website Taproot Folkarts lists the more than 50 skills that she teaches. But, back to the bow loom….here is one of the double bracelets that Marilyn teaches people to make on the bow loom…. Marilyn and her husband recently launched their new Taproot Folkarts Video site where you can stream her class on the bow loom or purchase the dvd. 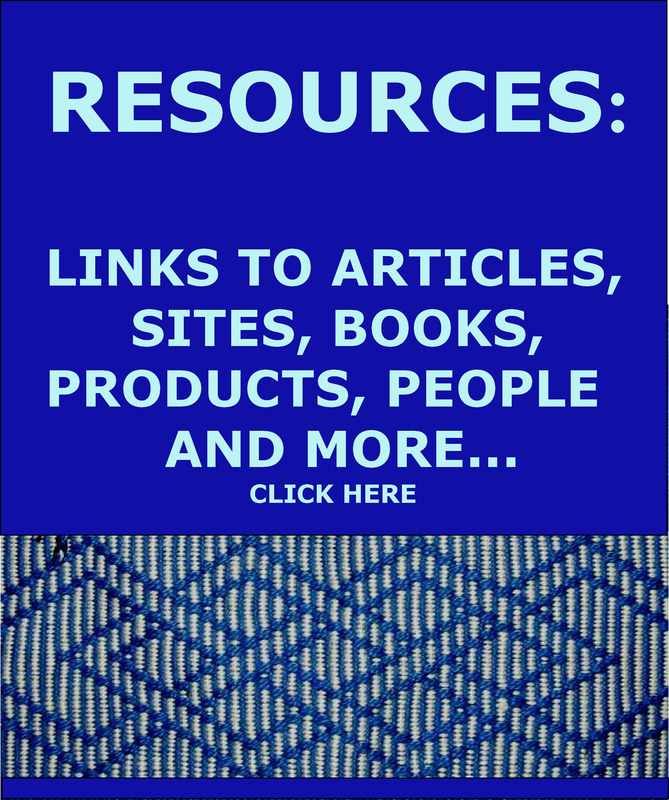 This is the site on which I plan to offer my own video backstrap weaving classes soon. 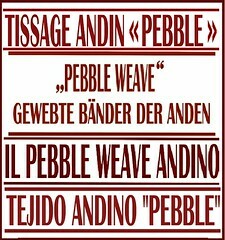 Let’s see what some of my weaving friends from around the world have been up to…. Peter lives in Istanbul and has contacted me via this blog on several occasions to ask questions about projects on which he has been working. He really needed some face-to-face instruction. There is only so far that you can go providing advice and instruction online. I asked Adem if he would be willing to help and the next thing I knew, Peter had traveled to Ankara at Adem’s warm invitation, was a guest in Adem and his wife’s home and was having lessons in Mapuche-style weaving on a backstrap loom. Fantastic! Here is another online gentleman weaver contact…this time from Mexico. Oscar contacted me a few years ago when he was taking his first steps in backstrap weaving following my blog. I just LOVE this picture that he sent me back then…a weaver in heart and soul! Let’s see what he has been up to lately. He learned the warp-faced double weave technique from my blog and look what he did with it! I think that there just might be a connection between Oscar in Mexico and Adem in Turkey. Perhaps Oscar watched the video that Adem made and allowed me to post on how to use sticks to hold the pattern warps for the simple warp-float technique. You can see the video in this post. Ginny sent me a picture of her recent county fair entry…her gorgeous felted slippers with ñawi awapa laces…winners! I love seeing my students putting the techniques to use like this! Another county fair winner….here’s Tracy’s backstrap weaving which she backed and filled to make a lovely pillow. That’s all her own handspun yarn and I can tell you that it is simply gorgeous. I got to handle this piece still on the loom when Tracy and I got together last spring in Seattle. There are no surprises that this took a blue ribbon…Her handspun yarn did very well too by the looks of it. Julia sewed her latest piece made from commercially spun wool onto a pillow. She is just getting into using wool for her backstrap weaving, experimenting with various weights and types while she sees what characteristics of commercially-spun wool make it suitable for warp-faced weaving. Looks like this yarn was a winner. The larger patterns are charted in my first book. Roli in Nigeria sent me pictures of the finished robe, hat and bag on which she had been working. I posted pictures of her first white strips of cloth some time ago on this blog.She weaves strips of white warp-faced cloth on a simple frame loom and sews them together to make garments. Her husband is modeling this set. The red patterning is done using the simple warp-float technique. 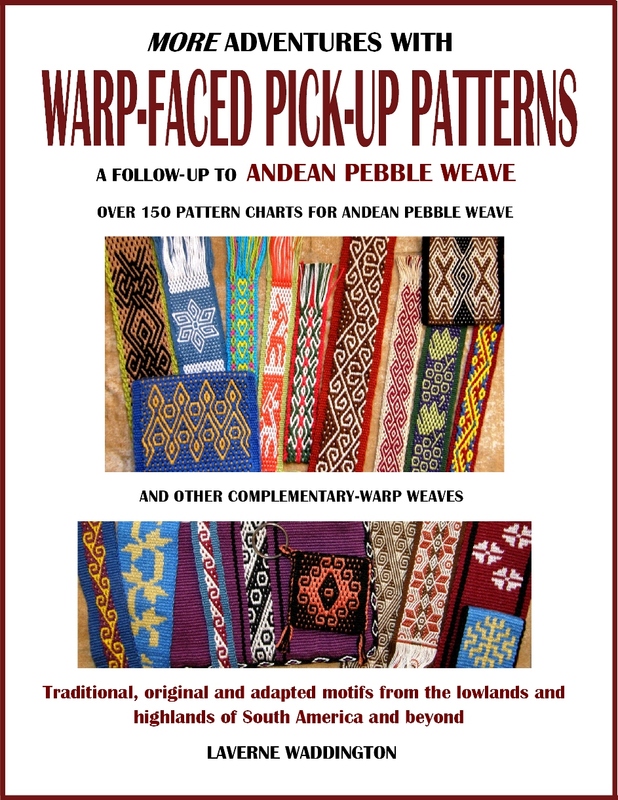 Yingyu Hung in Taiwan has been working from my Andean Pebble Weave e-book and has finished a sample band of some of the 8-thread patterns using a backstrap loom…. And, one of my most recent students, Cathy, here in Melbourne, has been practicing Andean Pebble Weave. She has woven a pattern that I discovered once purely by mistake when I set up my pebble heddles back to front. It was immediately after having studied the technique in Peru way back in 1996 and I obviously was not yet entirely clear on the process. I decided to call this pattern ”rabbit ears” at the suggestion of one of my students. You can see the lovely premises that the Victoria Handweavers and Spinners Guild has in Melbourne with its craft supplies store, library, handwoven and knitted goods store, exhibit space, workshop space and more. I have been building up quite a shopping cart of Australian-made goodies from the craft supplies store! Gerlinde not only gave me these pictures to use, she also gave me two beautiful bands from Chile woven with handspun wool by Mapuche weavers. One was created with double weave and the other with a complementary warp-float structure. She obtained them in Europe. From there they went to Australia and now I will carry them back to Bolivia, relatively close to their place of origin. I don’t have any Mapuche pieces and these will be a wonderful addition to the samples I bring to show my weaving friends…. Now I am heading off for a day of weaving with my Melbourne friends. I’ll tell you more about the visit in Melbourne in the next post. Happy Birthday and welcome home Laverne! I enjoyed hearing the birdsong from “the other side”. And I missed you in Washington by a couple of weeks. Hi Paula. I am in Washington quite a lot. Yes, I hope we can meet. Kalgoorlie is a long way from anywhere but one of these days your travel plans and my travel in the U.S. are bound to converge! Happy (belated) Birthday, Laverne! I agree that the gum-leaf shape is a must for your future projects. It is so elegant, and you do elegant so beautifully in your designs. Thanks, Ingrid. Hope to see you on board too! I discovered your website warlier this year and wish I had found it uears ago! Your enthusiasm and knowledge about weaving is awe inspiring and I look forward to reading your blog updates as they are always so interesting yet fun. Have you ever considered doing a thesis on backstrap weaving? You have such a great amount of knowledge that you so generously share with everyone! Thank you! 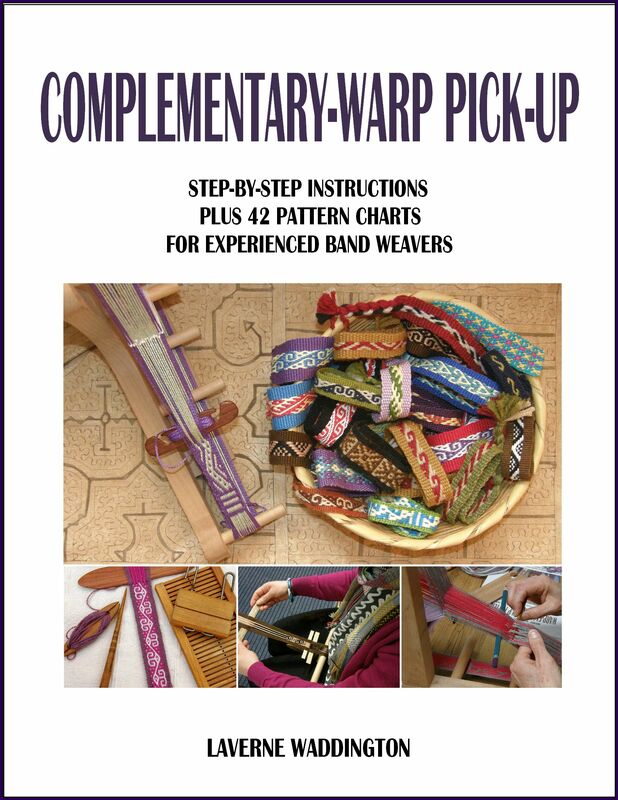 I write my blog and publish how-to manuals and that with the weaving and teaching keeps me pretty busy. It is nice to think that there may be more writing in the future. There’s another how-to book in the works and a video. Belated Happy Birthday. Cant wait to see you here in the states again. Let Ace and I know your schedule when in the states again. Going to Trailing of the Sheep in Idaho. May be a good one for you to do a class at. Many things offered in Ketchum. Your trip home sounds like you really enjoyed yourself. Can’;t wait to read about your time in Melbourne. Looking forward to catching up with all of you again in Ventura soon, Ginny. Happy Birthday! I love the gum leaf, and thought, “Hum, I need to remember that shape and weave it, ” and then DOH, there’s my backstrap and I’ve already woven it. Thanks for this very inspiring article.